Last night, on 9th April, the Villa Pamphili U16 team played and won a friendly match against the Welsh U16 team from Monmouth School. The Welsh team was accompanied by John Charles Bevan, a legend both in Welsh rugby and in the British Lions. The young players are currently in Italy to play against three local teams: Colleferro, Villa Pamphili, URC.. The match was refereed by an official from the Italian Rugby Federation (FIR) and provided an excellent opportunity to sustain Villa Pamphili’s competitive spirit, twelve days before the beginning of the under 16s national championship final..
Villa Pamphili, finding itself at last with its full complement of players, rose to the occasion displaying tremendous concentration and determination, which resulted in a 50-19 (9-3) win for the Romans. 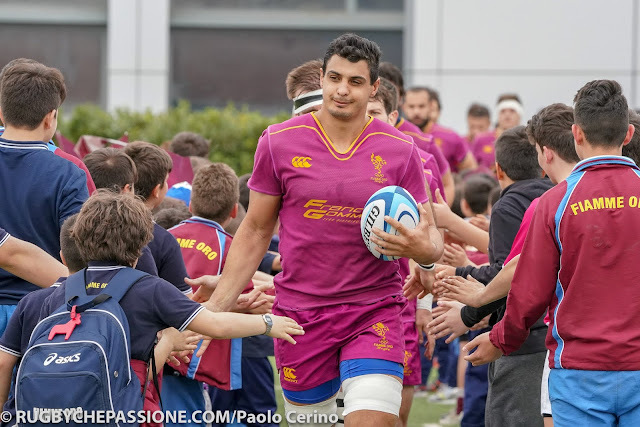 On this occasion as well, following an aggressive start on the part of the Italian players, the Villa Pamphili team scored their first try almost immediately and minutes later, their second. However, the Welsh team hadn’t come to Rome to sightsee and, once they got used to the field and the light (the match started as the sun was setting and soon after it was necessary to turn on the artificial lighting) they showed what they were capable of. They are a tightly-knit team and extremely well-disciplined and they also scored two tries. At the end of the first half VP was only one try in front: 19-10 (3-2). In the second half both teams used up all their available players and the final score was 50-19 in Villa Pamphili’s favor. Our boys were extremely lucky to have had such an experience with a team coming from a country where rugby is almost a religion. From the outset, the boys from Monmouth displayed an excellent team spirit, paying close attention to instructions from the team’s staff. Villa Pamphili showed significant improvement in its defense capabilities and displayed its usual strength in attack. the Villa Pamphili team hosted a genuine Italian dinner featuring pasta with meat sauce (pasta al ragù), which was enjoyed by the boys, the technical staff and family members accompanying the Welsh team.